If you want to achieve the best results in time for the arrival of summer, you should know that it's possible thanks to supplementation. We'll tell you everything you need to know. The arrival of summer makes athletes strive to their highest levels in order to show off their bodies during the warmer months. Therefore, in this article, we’ll review the ideal supplements for bodybuilding in summer. Undoubtedly, the high temperatures of the summer months make it more difficult to complete a good workout since fatigue and tiredness can increase. In these cases, you need to know which supplements are ideal for consuming this summer in order to ensure that your progress isn’t compromised. It’s possible to accompany the foods that you include in your diet with supplements that will make you have faster and healthier results. They can also increase your sports performance. In fact, during summer, they are perfect since you usually eat smaller quantities with less control over your schedule. Don’t forget that a healthy diet is the best ally to get toned muscles. The first point you should take into consideration is that sports supplements are a great help. However, it’s important for you to use legal products that are authorized by health authorities. Next, in terms of food, it’s crucial that you don’t abuse your fruit consumption, as some fruits contain high levels of sugar that can transform into fat. Additionally, you should try to eat five to seven small meals each day to ensure that your body has enough energy. Don’t forget that a good diet is the key to success in achieving your goal of hypertrophy. On the other hand, hydration is also one of the most vital aspects of sports practice. Hydrating and oxygenating the body is essential. The high temperatures during the summer can cause you to lose a lot of water while working out and your musculature will be less effective. Therefore, make sure you replenish the amount of water you need to give your best during training. 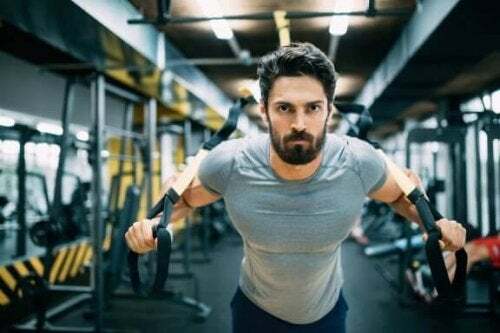 Here is a list of some sports supplements for bodybuilding that can be useful for getting your muscles toned during summer. Don’t forget to consume them responsibly and ask a specialist for advice. Without a doubt, protein is the basis of your muscles and rapid growth is simply impossible without it. Thus, we recommend consuming the greatest possible variety of foods rich in proteins, including vegetable protein. Protein helps build muscle tissue. You can also get the protein you need from dairy products and red meats. Although, protein shakes are the perfect complement to cover your daily protein needs. In second place are carbohydrates, as they are essential for the supply of energy and replenishment of glycogen in the muscles. They are necessary to be able to train hard at the gym. Carbohydrates are basic and crucial. Besides, they provide energy to the rest of your body and nourish your muscles. In fact, they’re one of the most important macronutrients for your muscles in terms of energy production. Lastly, creatine is another sports supplement that offers excellent results for athletes. It helps to increase your performance, allowing the muscles to work with greater intensity during workouts and reduces fatigue. It will allow you to increase the number of repetitions, as well as the amount of weight you can lift. Creatine increases oxygen production and improves blood circulation to aid in post-workout recovery. Moreover, it contains caffeine, which stimulates the central system and is ideal for better mental focus and promoting fat loss. In addition to being generated by the body, creatine can be obtained through foods like meat and fish. Finally, you shouldn’t forget that if you don’t have enough knowledge, the best option is to seek good professional advice. This guidance will help you set realistic objectives and is also a source of motivation for achieving the purpose of getting in shape for the summer.